Contains significant, effective level of Phenylethylamine (PEA). Synergistic action with other stimulant compounds - Bacopa monnieri, Ginkgo biloba, Eleutherococcus. With this amazing, ingenious, innovative and sophisticated formulation - SuperSmart is going back to its first love' - stimulants for the brain! 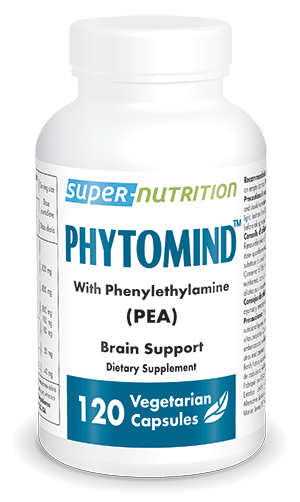 Phytomind is the first formulation to contain a significant and effective amount of Phenylethylamine (PEA). PEA is an endogenous (produced naturally) neuroamine, sometimes called a neurohormone. It increases brain attention and activity and - like Prozac - relieves depression in 60% of patients, but unlike Prozac - has no contra-indications or side-effects. People in love have particularly high brain concentrations of PEA (it's responsible for love at first sight'), as do long-distance runners, which might explain the anti-depressant effects of endurance exercise. Plain chocolate is one of the best food sources of PEA - a possible reason for the enthusiasm and passion shown by chocaholics! According to scientists, PEA improves mood faster than amphetamines and is non-addictive (J Neuropsychiatry Clin Neurosci, 1996 spr. 8:2, 168-71). It's a natural treatment for depression which acts over a few hours or days. PEA is particularly suitable in cases of manic depression, for which another particularly effective supplement - SAMe (see product), is not recommended. Other ingredients: Microcrystalline Cellulose, Magnesium Stearate,, Silicon dioxide. Klamath Valley Botanicals, LLC, USA. Take two Phytomind capsules in the morning on an empty stomach - the dose may be repeated mid-afternoon.